Photo caption: Protest organizers posted a banner with student grievances written all over it above the front entrance to Main Hall and a sign on one of the building’s columns listing aspects for which protesters are advocating a change. 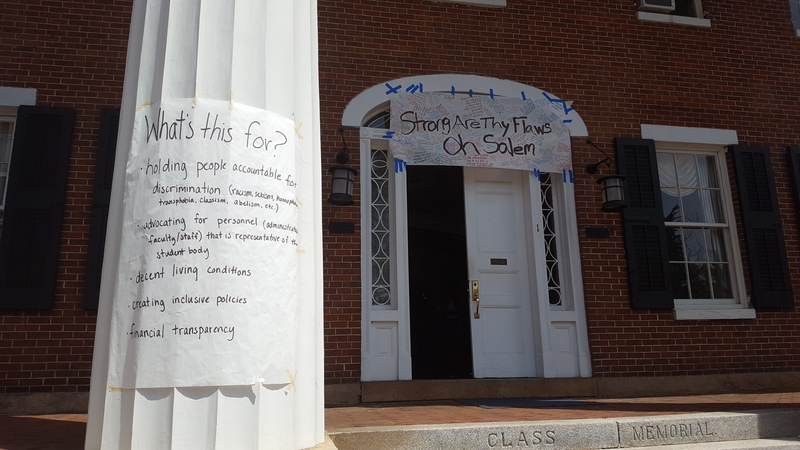 This week, a passerby in Old Salem may notice the front door of Salem College’s Main Hall propped open, hear music from within, see a banner above the entrance and observe students sitting inside. The protest at Salem College began with a walk-out when individual students came into classes that were in session at 11:15 a.m. on Monday stating grievances and inviting other students to protest in Main Hall. Students participated in a sit-in on the first floor of Main Hall, which continued at 8 a.m. on Tuesday, to protest issues noted in a 10-page call to action. Topics listed in the call to action, which was addressed to the Board of Trustees, administration, faculty, staff and the Salem community, include discrimination, health services, mental health services, financial transparency, gender policies, housing upkeep and campus-wide diversity training. Several students met with administrators on Tuesday and they hope to continue holding meetings to negotiate the items stated in the call to action. A group of individuals, including those from BADU and Committee on Community worked to organize the sit-in. “Less talk, more action” was one of the phrases that students chanted from the front steps of Main Hall. Their goal was to be seen and heard by the college’s administration. When members of administration were scheduled to leave at 5 p.m. on Monday, students organized in a semi circle outside of office doors with signs to ensure that they would be seen. Administrators left the Inspector’s House after 7 p.m. Protesters left Main Hall around 8 p.m. on Monday and returned at 8 a.m. on Tuesday. and at 8 a.m. on Wednesday. Alumni delivered bottled water, pizza, snacks and fruits to Main Hall for student protesters from Monday to Wednesday. Students also arranged for alumni to donate via PayPal for food and other supplies for the protesters. Several news outlets covered the protest. Using the hashtags #SalemSits and #4Hoursfor4Years, students also posted updates and aimed to reach out to alumni and the Salem community via social media. A Facebook group called Salem Sits Protest Page shares updates and news coverage of the protest. Today, a Roundtable Wednesday meeting was held to address the history of Salem Academy and College as it related to slavery. During a discussion about the origins of the protest on Tuesday, protest organizers encouraged student protesters to attend the meeting on Wednesday. The Salemite has a live recording of this event on its Facebook page.